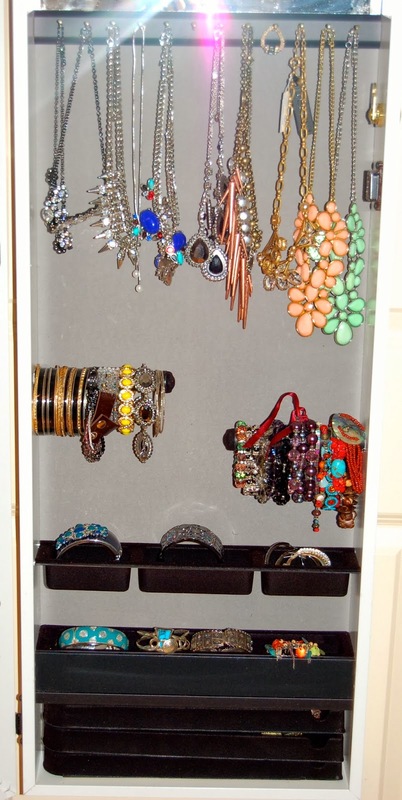 I had seen the over the door jewelry organizers all over the internet but when Hope from the blog Beauty & Bliss posted a photo of her new organizer on Instagram I got to see it really being used and I fell in love. The Over-the-Door Jewelry Armoire from The Home Shopping Network is $159.99 and shipping is free. I received it in only 2 days which was awesome. I ordered it in white because I didn't want it to stand out too much against my closet door. 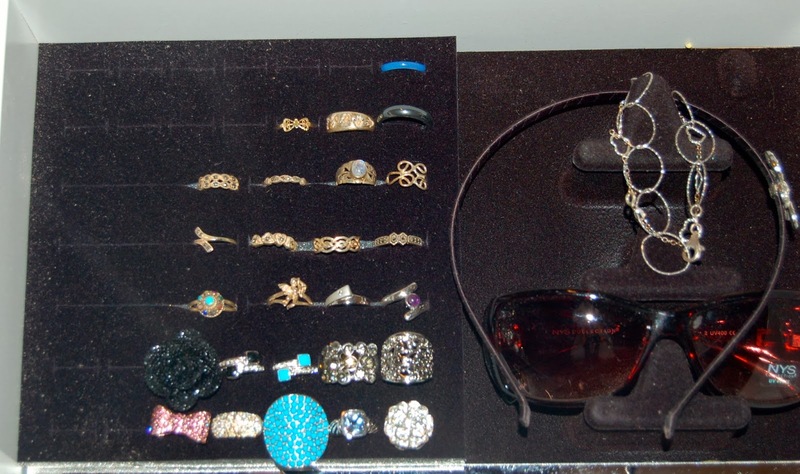 Here are some photos of what my jewelry "organization" looked like before. 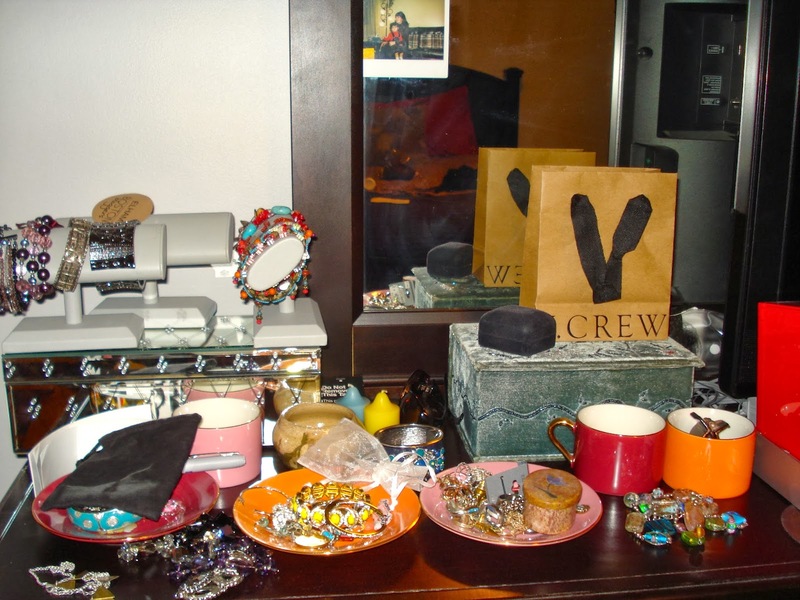 I used a combination of tea cups, saucers, jewelry boxes, bags, and even a Christmas ornament hanger (yup!). Now some photos of the armoire all filled up. I love this organizer. It's such a space saver and fits ALL of my jewels perfectly. 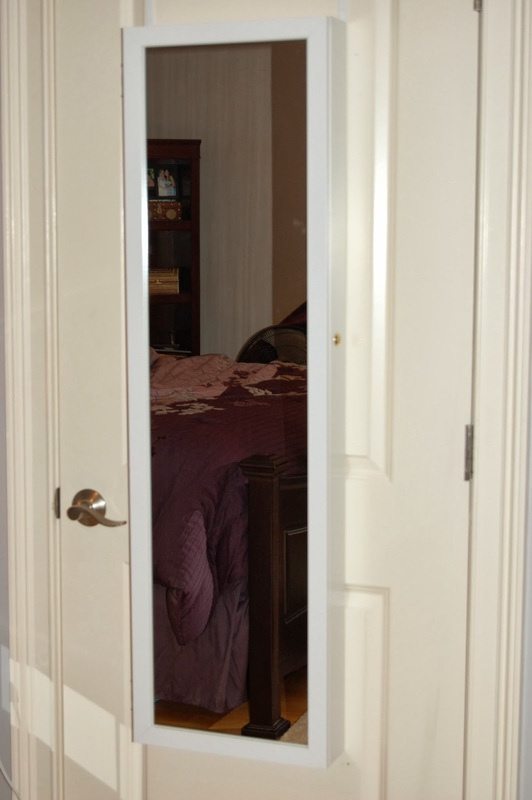 One of my concerns were if this would move or "swing" whenever I opened or closed my closet door but it doesn't move at all because it's sturdy and heavy enough (though not too heavy because I was able to lift it myself). 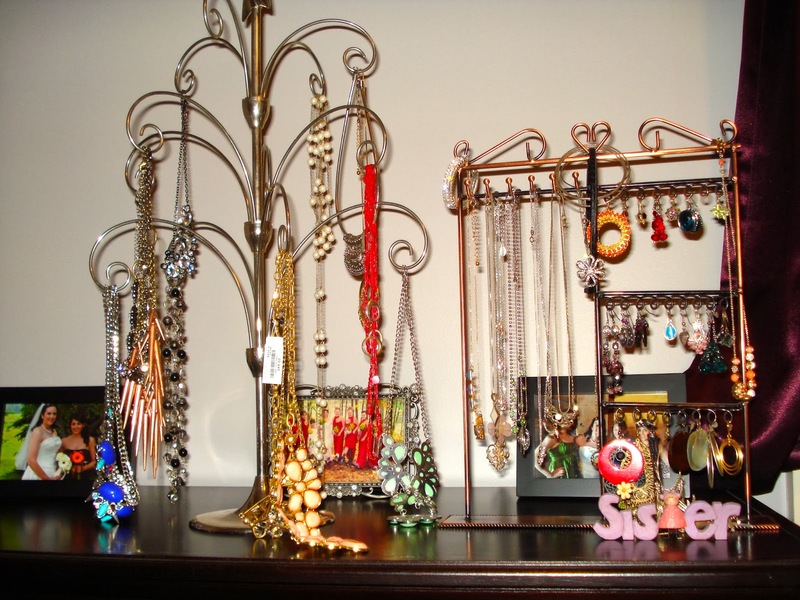 If you're considering one of these over-the-door jewelry armoires, definitely try this one out from HSN! I saw Hope post a picture of it..! How sweet..! Love how much it stores and how you can close the door and it's put away..! Great buy! 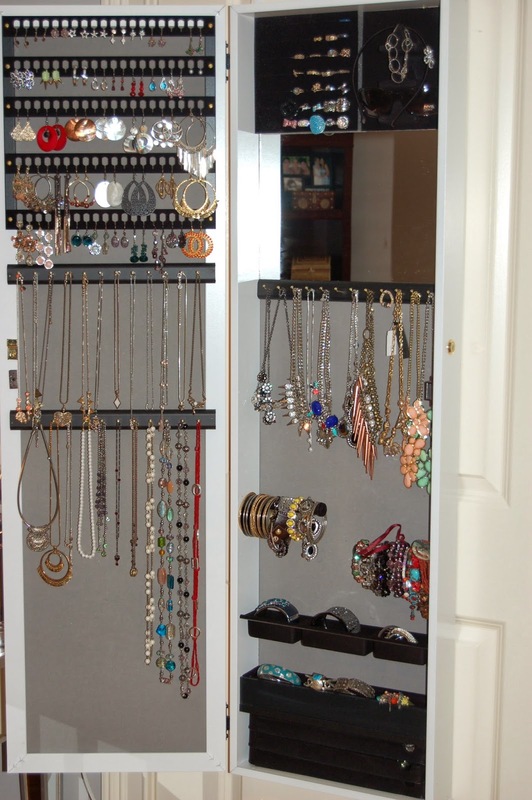 Yes, it stores a TON of jewelry and keep it totally out of the way and almost hidden! Thanks for visiting! wow! that organiser is amazing and wow what a collection!!!!!! To be honest, I rarely wear my jewelry either but so far this has made me wear it more b/c it's all just right there! well I would highly recommend this Elle! Yes, I was doubtful this would fit all my jewel but it fit perfectly! I do have to get rid of some stuff so that will free up some space too. Wow! You have an amazing collection! That organizer looks so spacious...what a great find! This is an amazing find. I love this. On top of all that storage you get a mirror too! This was an ingenious contraption. Thanks for sharing with us. You have tons of cute jewelry too! Thanks, it's one of the best purchases I've made in a long time! Hey El! I have a standing jewelry armoire but its just too small for my long necklaces. I would def like to order something like this but I have one question...Does it scrape the molding on your door frame? I had a robe hook on the top of my door and it was ruining the wood so that is why I am hesitant to buy something like this. Other than that this is great! Esp for the price! thanks for sharing! Well so far it hasn't scraped my door frame and I can't imagine that it ever will b/c it doesn't move around at all. There's also the option of mounting it on the wall but that was way to confusing for little old me. Haha, thanks for visiting! Awesome! Just one more reason I need this in my life! My birthday is coming up in a few months so I may put this on my list! Thanks for the visit! I love SITS, I learn about so many new blogs! I love this! 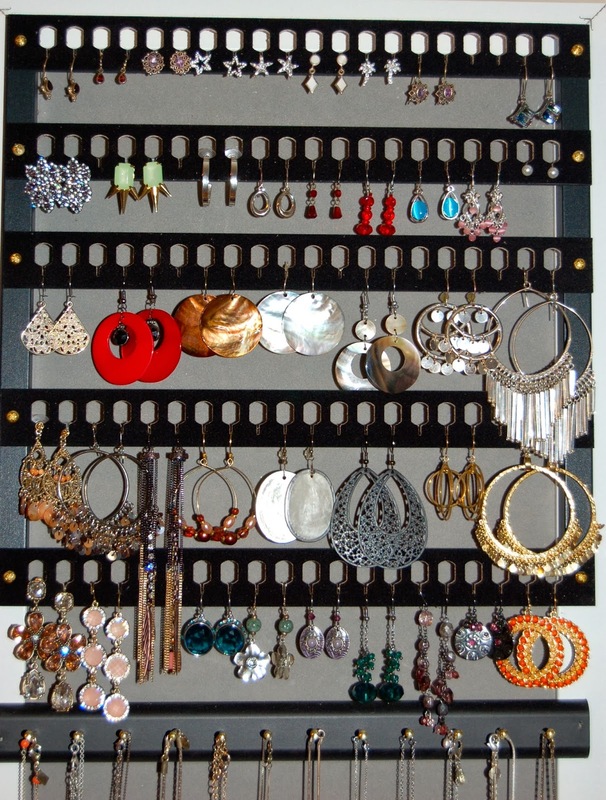 I have been looking for a way to organize jewelry, forever. Well I highly recommend it! Thanks for stopping by! I've been looking for something to store my jewelry in, I'll have to check this one out! Thanks!! Yes, def. do! It's one of the smartest purchases I've made in a while! I am so jealous. I would love one of these. I highly recommend, you'll love it!